Olympic Kilns builds affordable powerful volume producing glass kilns. Users are provided with equipment that handles capacity loads and large pieces with ease. 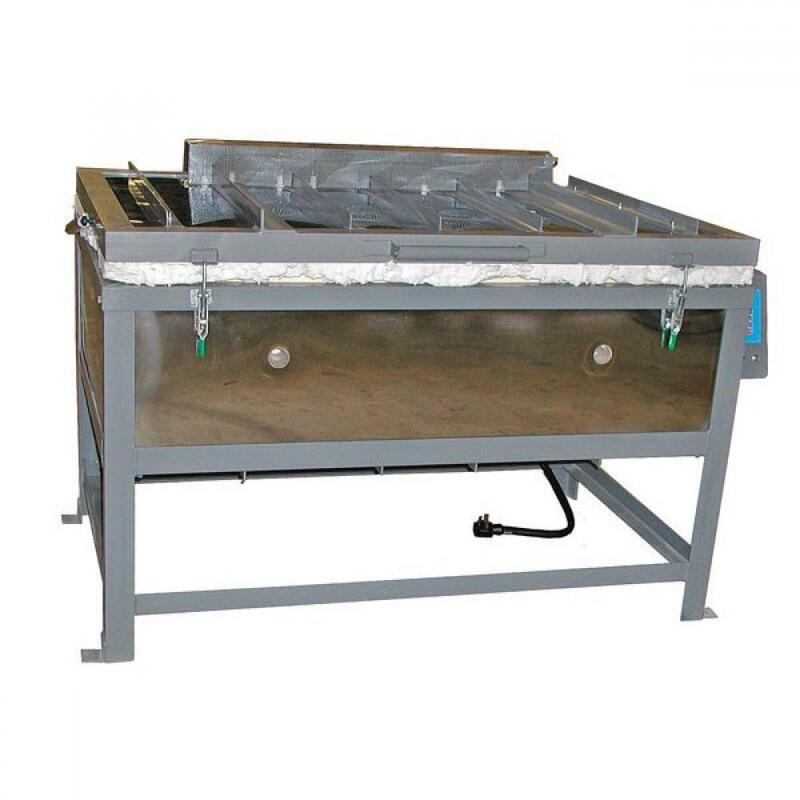 The Production Glass Fusing kilns have many outstanding features and can be designed as top loading, clamshell loading, or both top and clamshell loading; and as a Bell design with the firing chamber electronically raised and lowered and a removable floor for convenient loading and unloading. The frames of the Production glass fusing kilns are built of heavy angle iron and metal tubing. Kiln walls are 4 ½” insulating brick with 1” ceramic fiberboard and 1” air space created by the tube frame. The result is an energy efficient heavy load production kiln with a cooler outside surface and temperature. These models are built with double insulated floors consisting of brick and ceramic fiberboard. The kilns walls and floor are constructed of kiln brick and board insulation. Kiln brick, ceramic board and pyro-block modules comprise the easy opening counter sprung lid. Floor elements, when selected as an option, are controlled by infinite switches which can be adjusted by the kiln operator as needed. Glass fusing production kilns are equipped with heavy gauge elements and industrial relays for long life. Production volume glass kiln models have a hinged electrical box for easy access and their own breaker box for easy access, safety and lockout. Production glass kiln models come equipped with pilot light, heavy angle iron frame, stainless steel jacket, breaker box, Bartlett RTC-1000 digital electronic controller, instruction manuals, and warranty card. One-year Limited Kiln Warranty. Options are available include lid elements in quartz rods, Type S thermocouple, 2 or 3 zone control, 480 volt, vents, and much more. Furniture Kits are available and provide 1 layer of shelving with smooth ceramic fiberboard, ceramic paper and large square posts. Some options must be quoted because of variations in models. Custom-made Production Glass Fusing kilns quoted upon request.